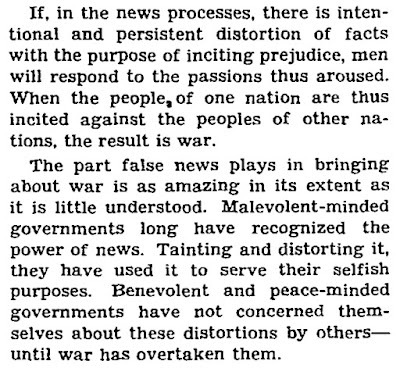 "To Prevent War—No News Blackout"
"If, in the news processes, there is intentional and persistent distortion of facts with the purpose of inciting prejudice, men will respond to the passions thus aroused. When the people of one nation are thus incited against the peoples of other nations, the result is war. 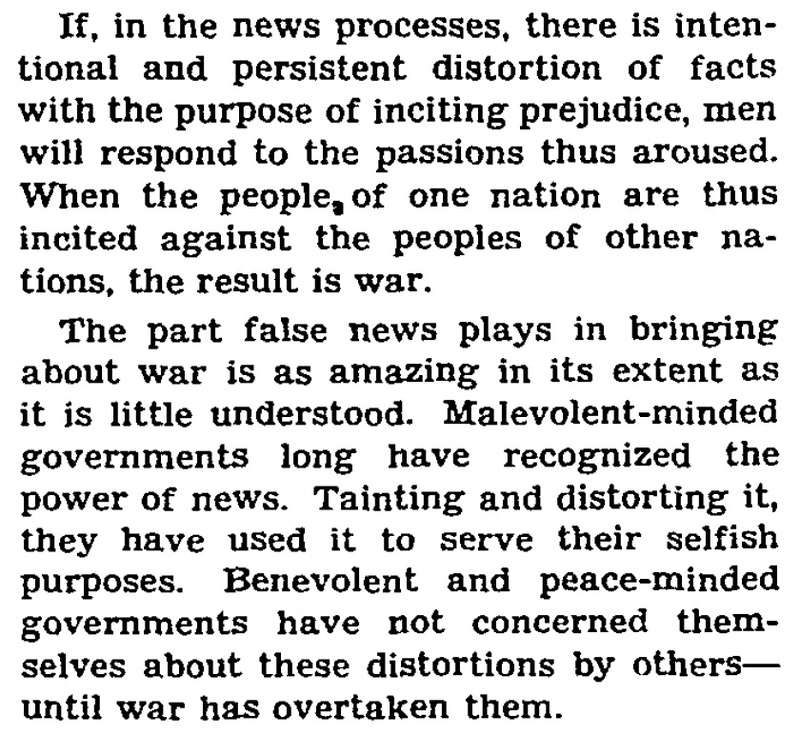 "The part false news plays in bringing about war is as amazing in its extent as it is little understood. Malevolent-minded governments have long recognized the power of news. Tainting and distorting it, they have used it to serve their selfish purposes. Benevolent and peace-minded governments have not concerned themselves about these distortions by others—until war has overtaken them . . . [T]hrough jealousy or in revenge there are fiends who, through the news, have successfully poisoned the minds, not of one or two persons but of a whole nation . . .
"Availability of the truth, the most powerful force in the world, through a free press served by an adequate system of world-wide communications established for the purpose, should be our aim. For we should not forget that when we plan to enshrine freedom in any field, the first requisite is the right to know." We must spread the truth, says Kent Cooper, and make it a shield to guard world peace. "Though, before the sixty-thousandth issue of The Times makes its appearance, science may well have revolutionized the mechanism by which written word is reproduced and distributed, the fundamentals of journalism will not vary. It will still be the duty of a newspaper to hold fast to the distinction between fact and opinion and, whatever views it may hold and express, to furnish for the readers' judgment a supply of news as full and impartial as energy and good faith can make it." Unfortunately, that declaration of the function of newspapers could not have defined the actualities of newspaper publication in many lands before the war. If it could, there would have been no war. And that is just how transcendently important to peace is "a supply of news as full and impartial as energy and good faith can make it." For news is the sole basin upon which men promptly learn and judge the thoughts and actions of their fellow-men who are beyond their immediate local acquaintance. If, in the news processes, there is intentional and persistent distortion of facts with the purpose of inciting prejudice, men will respond to the passions thus aroused. When the people of one nation are thus incited against the peoples of other nations, the result is war. The part false news plays in bringing about war is as amazing in its extent as it is little understood. 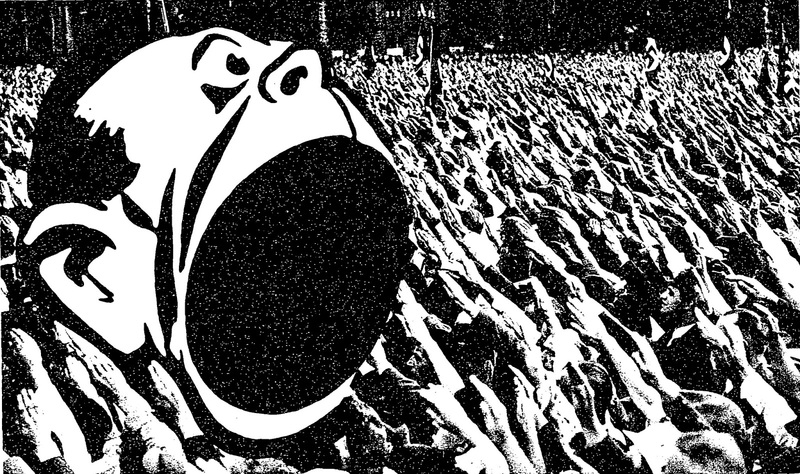 Malevolent-minded governments have long recognized the power of news. Tainting and distorting it, they have used it to serve their selfish purposes. Benevolent and peace-minded governments have not concerned themselves about these distortions by others—until war has overtaken them. Every country, even though only partly civilized, has laws to punish those who intentionally poison the food of others. Through jealousy or in revenge such crimes have been committed, but usually only one or two lives have been placed in jeopardy. No fiend has yet concocted an attempt to poison the bodies of an entire population of his own or another country. But through jealousy or in revenge there are fiends who, through the news, have successfully poisoned the minds, not of one or two persons but of a whole nation. For an understanding of how news has come to play so important a part in the lives of civilized men let us go back to the beginning. Once the town crier spread the news. Then came the newspaper, supplemented later by the broadcasting station. The marvel known as electricity served to bring men into closer knowledge of one another. Actually, the first practical application of electricity for the benefit of the whole people was to bring the news from far and wide. The telegraph, cable, telephone and finally the wireless annihilated the distance between nations and between individual communities. In this country each locality was linked with all others and our whole life integrated into one homogeneous national community. And yet our conception of the importance of news dissemination and publication, for which science furnishes the means of instantaneous world-wide transmission, remained provincial; or perhaps we ignored the subject altogether. The news was one of the things to which we had become so accustomed that we thought about it only when we could not get it. While we had seen, unconsciously, what it had done to unify our own country, we had never realized that it contributed more than anything else to synchronized thinking and action. The news could never have served us as it did and does serve us had it not been for the freedom of the press, which made the printing of that news possible. 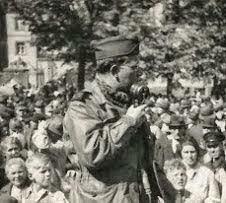 We had our freedom, we had a press free of government control which stood guard for that freedom. Satisfied with our own development, we did not greatly concern ourselves with the affairs of the world. Then from our provincial dreaming we were twice rudely awakened to find that science has indeed made our globe smaller. News could no longer be confined principally to our own activities. And with the coming of the second World War we began to ask ourselves where these wars are bred. The history of the European press in the years that preceded the present war reveals clearly how large a part poisoned news played in bringing on the war. That poison was of two kinds—a kind of gray poison that was doing its work almost everywhere in Europe and in Asia before the advent of Hitler, and the utterly black poison that came with the Hitler-Goebbels scourge. Even in the years before the Nazi blackout, events had given little comfort to those who believed that freedom of information and an honest, responsible press were the surest shields of peace. In almost no country was the truth faced. Typical of the situation, and possibly in its worse form, was what was happening in France from 1919 to 1939. Not only were Havas, the French news agency, and the French Government in effective league to prevent the full picture of world developments from reaching the French people, but the French press itself abdicated its proper responsibilities and functions. Long before the second World War fell upon the bewildered French people they had been deserted by all but a small fraction of the press. Newspapers were largely subsidized, in one fashion or another. Editors and reporters frequently were on Government, party or business payrolls and many newspapers were directly controlled by political or financial groups. News columns were bought as a common practice. This was true particularly of the Paris press. There were some independent newspapers, but most of these were in the provinces. The character of the French press was a mighty contribution to the disunity and confusion in which France marched to her catastrophe in 1939-40. And this was the picture in a nation that was considered a democracy. But the blackest poison was that generated in the Thirties in Germany, Japan and Italy. Then the suffocation of truth in the news was put on a totalitarian basis. Freedom of the press died with all the other freedoms in Germany on the night of Jan. 30, 1933, when Hitler became Chancellor. Newspapers and radio became instruments of a regime with criminal purposes. Editors and reporters became functionaries of the State. Journalism was defined by law as a "public task regulated by the State." The Ministry of Propaganda and Public Enlightenment was established under Goebbels. All media of information and expression were crushed into the Nazi mold, all bent to the purpose of whipping the German people into that fanatical frenzy necessary to the savage purposes of the Nazi dictator. By 1939 it was done; the Germans were ready to assume the responsibility for plunging the world into war. Japan's road into the darkness was similar. The press of Japan never had been free of rigorous government control, but in the late Nineteen Twenties there was developing a small group of Japanese newspaper men and thinkers with an enlightened conception of the responsibilities of the press and the importance of truth in the news transmitted from one country to another. Some beginnings were made toward adaptation of the cooperative principle of news agency operations. When the militarists on Sept. 18, 1931, embarked on the conquest of Manchuria and seized the reins of power in Tokyo, they began a revolution of which the significance was little understood abroad. The small element of the press that valued the small measure of freedom previously enjoyed was among the first victims. Terrorism, intimidation, powerful pressures were enlisted to bring the whole press into line. Even the comparatively liberal Asahi newspapers of Tokyo and Osaka eventually had to succumb. The story of the Italian press under Mussolini's dictatorship followed what we now recognize as the pattern for destroying all freedom of the press. The deep night that blotted out the truth in Germany, Japan and Italy need not fall on any country again, nor need there be maintained in most countries a murky twilight as far as knowledge of other people is concerned. Since it has been proved that poisoned news can generate a war, its antithesis, truthful news, should have a chance to prove that it can maintain the peace. Truthful news and a free press can do more than anything to avert war, but the acceptance of both must be real and sincere, not lip service paid to the ideals of a free press in countries which pride themselves on democratic institutions. We should realize today as we should have twenty-five years ago that members of this great world family of human beings are either not well enough acquainted or not acquainted at all. Since they do not all live in physical proximity they can come to know each other only by what they hear and what they read. An exchange of truthful international news would bring acquaintance and the result of acquaintance would be world-wide community of interest. If we are convinced that for an enduring peace an international community of interest should be established, we should see to it that America holds out inexorably for the two things that make world-wide community of interest possible—a world-wide free press and a communications system adapted to serve the press everywhere in a truly practical manner. For myself, I would proclaim now that we expect to accomplish this in the peace. I would not wait until the war ends, would not leave these vital elements to be tossed around upon the sea of indecision and intrigue which always prevail in peace negotiations. The establishment of a free press involves no expenditures, though it does involve a great deal of practical enlightenment on how newspapers through advertising and subscription rates can maintain themselves independent of political or private subsidy. On the other hand, an international communications system would cost a great deal of money, but it would not cost more than a fraction of 1 per cent of the cost of world armament. With these two instruments available for the establishment of an international community of interest, we shall have at least a groundwork for what might seem now to be utopian. The blessings of adequate communications and a free press surely were not given to us to exploit solely for our own benefit and to keep just for ourselves. Here in the United States the principle of true and unbiased news was first developed. If we would keep out of another war, then in self-interest we should see to it that the principle is given to the world in a militant effort to improve international relations. Availability of the truth, the most powerful force in the world, through a free press served by an adequate system of world-wide communications established for the purpose, should be our aim. For we should not forget that when we plan to enshrine freedom in any field, the first requisite is the right to know.